Where can I buy Hatchimals CollEGGtibles 12-Pack Egg Carton? Use this free stock checker to find out where you can buy the Hatchimals CollEGGtibles 12-Pack in the UK and which retailers have stock. The 12-Pack Egg Carton is one of the hottest toys this Christmas, in high demand and difficult to track. Nab one early if you can and tuck it away for Christmas. Set to be one of 2017’s most popular top toys it is the perfect accompaniment to the Hatchimals Hatchery Nursery to jump start your collection of CollEGGtibles! Tom - one for FB? 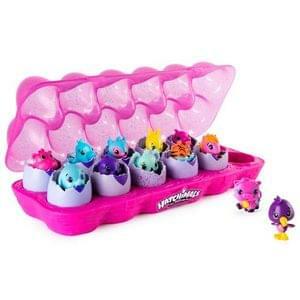 Very have the Hatchimals Colleggtibles 12 Pack Egg Carton available to pre-order today (14th Novenber). Awaiting stock. Expected back in stock on Thursday 7th December. Price £24.99. One to add to Stockchecker? The Hatchimals CollEGGtibles Egg Carton 12 Pack is also in stock at Hamleys today (21/11/17) price £25. In stock today (22/11) at Amazon, at a discount too! Open up the super glittery egg carton and you’ll find nests moulded into the bottom of each egg compartment. Your Hatchimals will love to snuggle into their cosy home while you take them everywhere you go! Hatch a whole world with the Hatchimals CollEGGtibles 12-Pack Egg Carton!